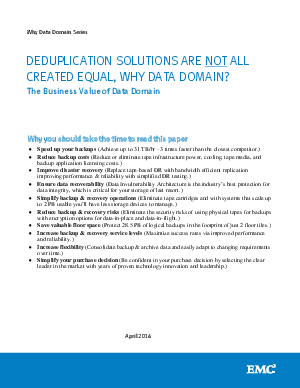 There is a common misconception that all deduplication systems are created the same and many organizations are now doing their homework prior to making a purchase decision. There are certain key things to look for when you are researching a deduplication storage solution and that is the subject of this paper. This paper focuses on Data Domain technology leadership and differentiation and why it matters to you. The purpose of this paper is to explore the technical and financial reasons why Data Domain systems are ideal for backup and archiving in your environment. Download this paper to find out how Data Domain can benefit your business.